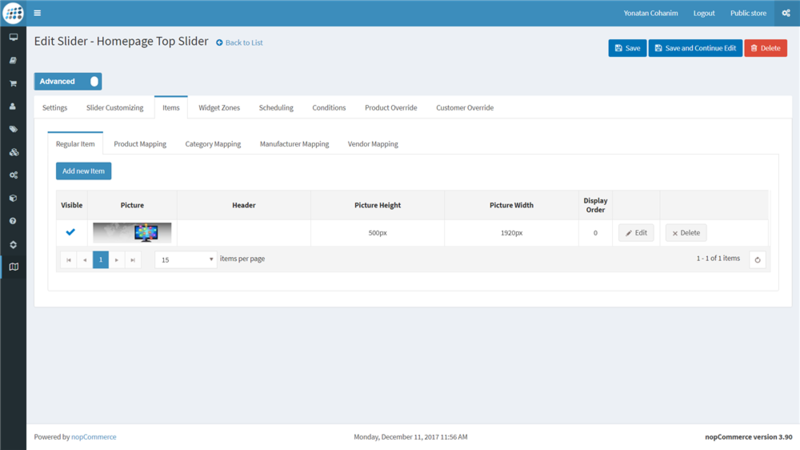 Multi slider plugin is an excellent tool for the nopcommerce website. 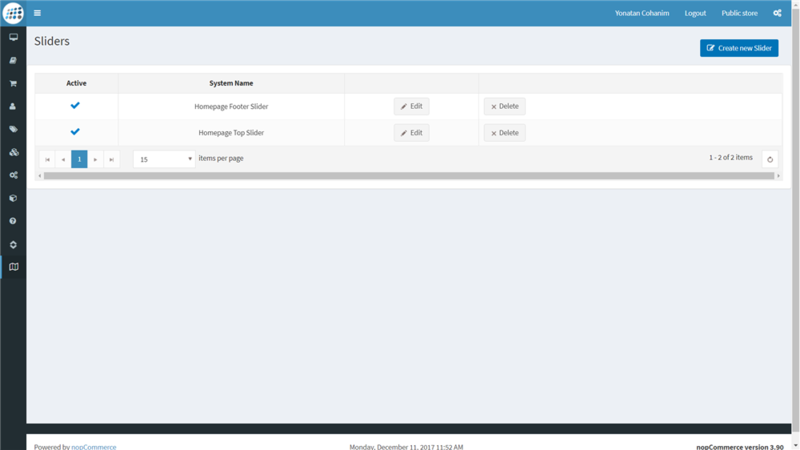 The slider allows you to add images, pictures, information and data, announcements, etc. regarding the website, its products, sales and more. The plugin is easy to edit with many features such as animated effects, size, navigation, time of appearance and disappearance and anything else relevant to the website and its purposes. 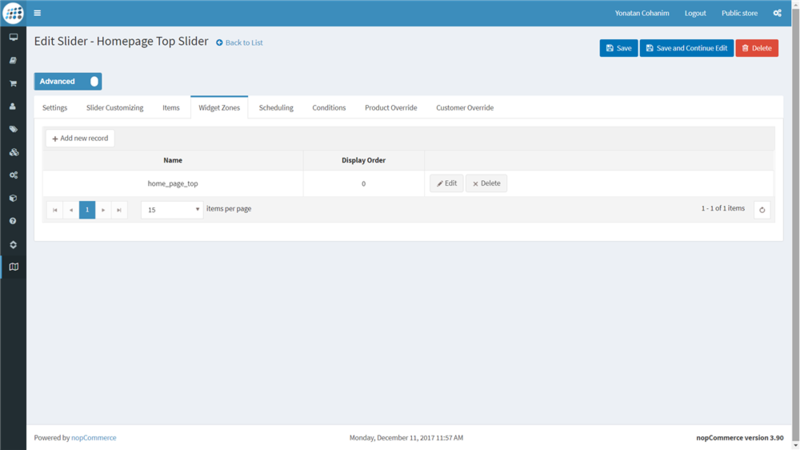 NOP-Nyco multi slider can be shown with conditions of your choice, such as different dates and times, certain pages and product pages, customers you choose to show them the slider and more. Editing the plugin is simple and quick. 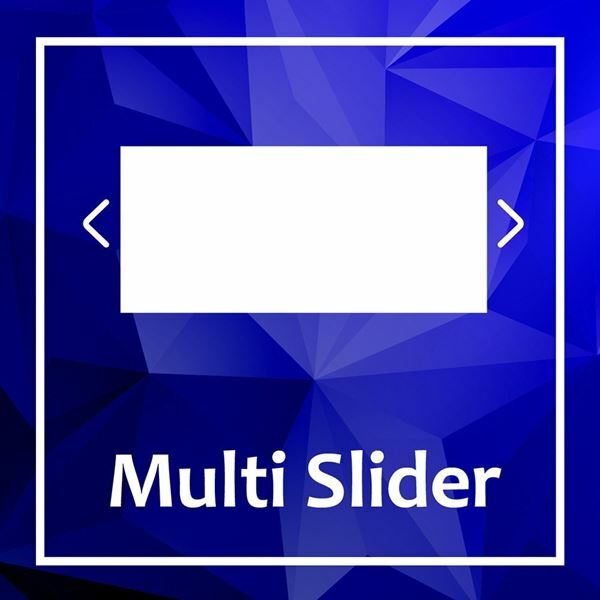 Use the multi slider plugin for your website purposes and add visual effects, designs and information to your website for the ease of you and your customers. 1. This list shows all the sliders in the website. From here you can manage and edit all the sliders. a). Normal - arrows for moving the slider on the right and the left. b). 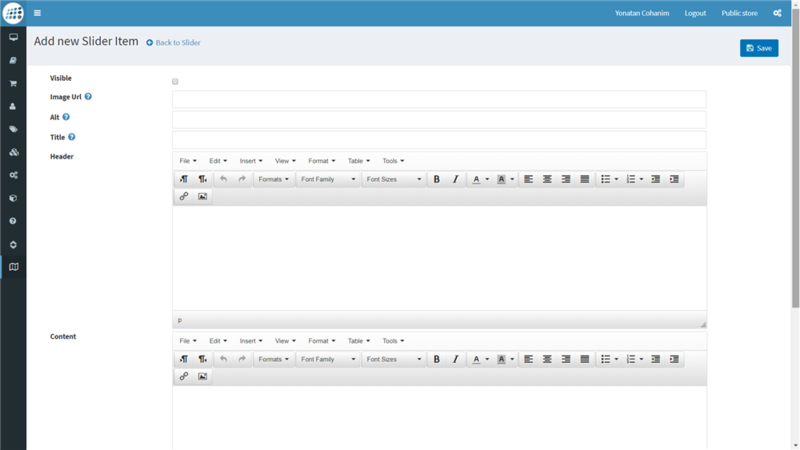 Carousel - arrows for moving the slider on the top and bottom of the slider. The height of the slider is permanent (global size) unless you want to change the dimensions of height/width. 3. Slider Customizing - Here you edit and customize the slider and its features: number of images shown, looping, in and out display, animated effects (such as: blinking, lights, fading, etc.). It is optional to choose the time in milliseconds for the image to appear and disappear. There is an option for navigation - if you want the slider to move automatically or only by clicking on the arrows. 4. Slider Items- Here you can input and edit your own pictures, images, banners, text. The other tabs show pictures etc. already in your website. 5. Add Item - This is where you save links, contents, images and more. A big advantage here is the option of inserting HTML content for giving additional information and service to the nopcommerce website customers. 6. Widget zones - Here you choose the location on any page in the website where the slider will app onear. 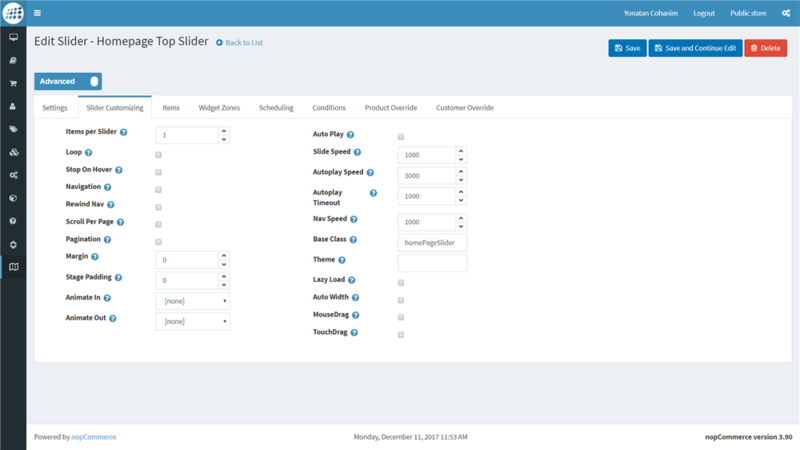 On one page you can put a number of sliders according to the website and customers needs. 7. Scheduling - manage the schedule of the appearance of the slider itself and the content inputed. 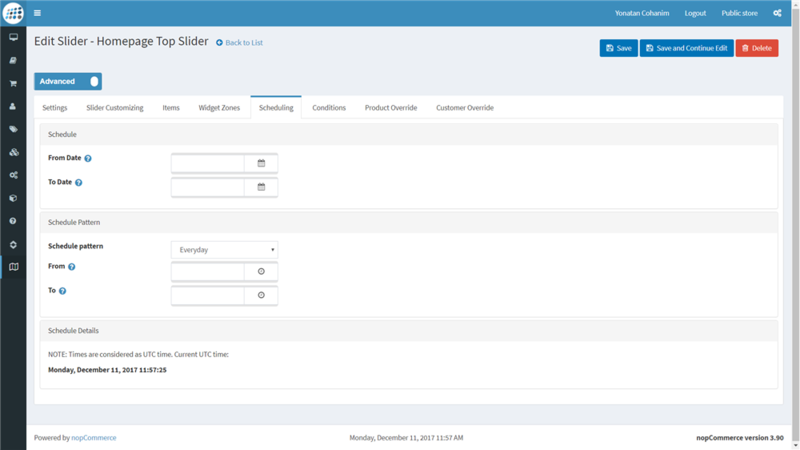 You can choose to have it appear in your nopcommerce website permanently or you can choose different dates and/or times. It could be holidays, birthdays, vacation days, special sales or anything else relevant. 8. 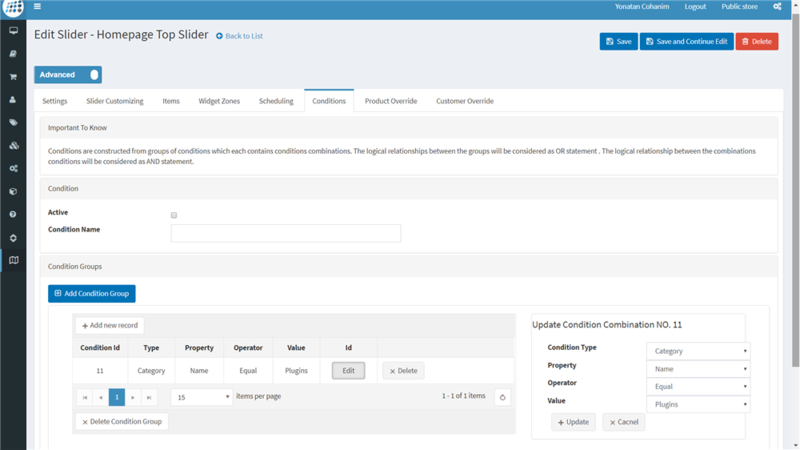 Conditions - The slider plugin allows you to choose different conditions in which the slider will appear or not, such as: products in stock, shown only to registered customers, certain manufacturers and more. 9. 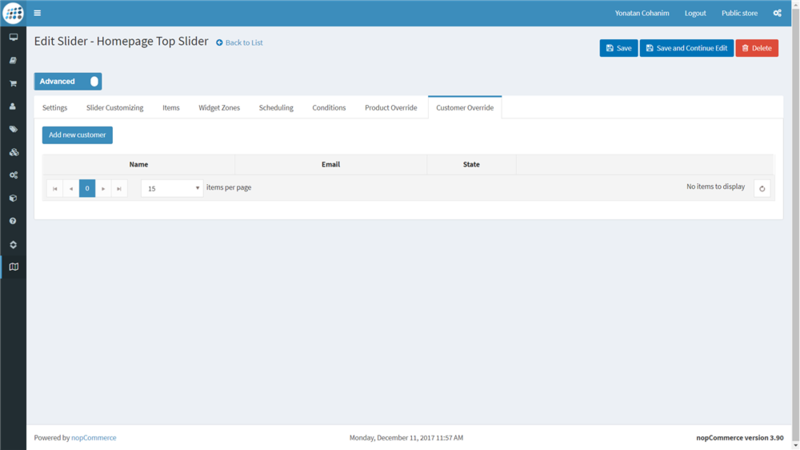 Product override - Here you choose (if needed) which products pages will include the slider or exclude it. You can always change this condition according to what is relevant to the website and the customers. 10. 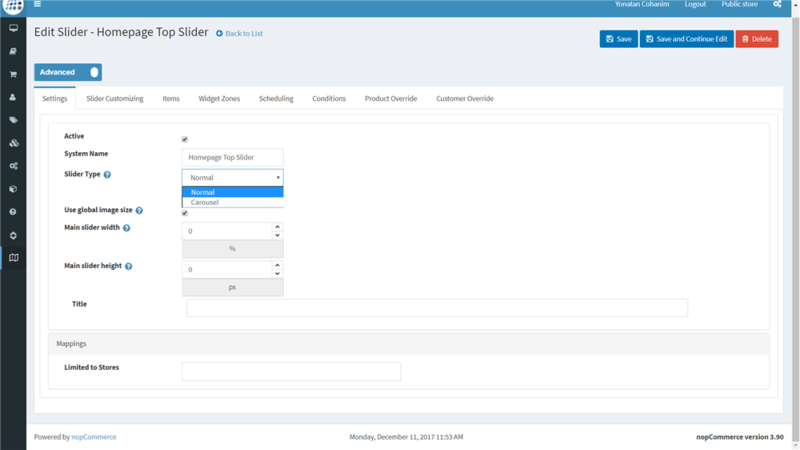 Customer overrides - Here is where you choose if you want to hide the slider from certain customers or not. For example, only registered customers surfing in the website now can see a slider about a special sale.